It seems fitting that the next blog post after my Little Black Dress post should be about the Chanel exhibition. The Mademoiselle Privé exhibition is now in its final week at the Saatchi Gallery in London, so on Sunday morning I decided to pay a visit. I got there 15 minutes before the gallery opened at 10am, but still had to wait a good hour before I got in - be warned, the queues are very long. The upside of the long wait was that I got to indulge in some top quality people watching. Mostly fashion types checking out bags and giving each other the side eye - highly entertaining! I'd describe Mademoiselle Privé as a cross between a fashion exhibition and an art installation. It's described as "a journey through the origins of CHANEL's creations, capturing the charismatic personality and irreverent spirit of Mademoiselle Chanel and Karl Lagerfeld." But despite being spread over three floors, there was next to no information to read - it was very much a visual experience. 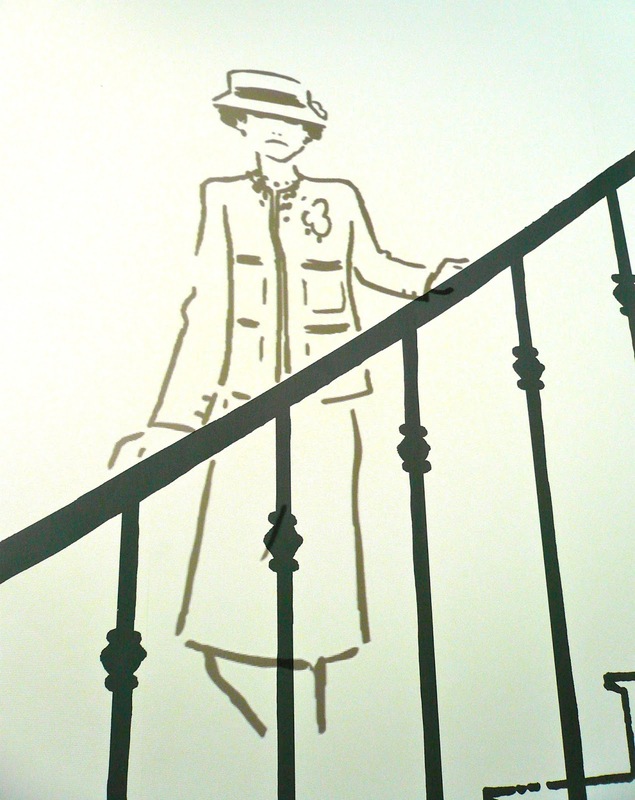 An illustrated version of Chanel herself appears amongst the displays in the first couple of rooms as moving footage (see below), which was quite charming. 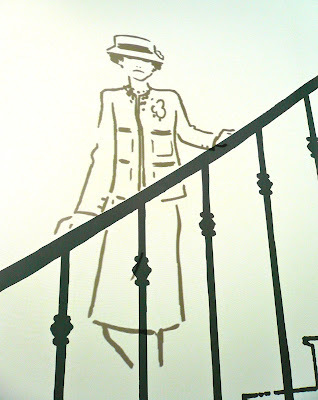 These rooms also focus on Chanel's early stint as a milliner and her visits to Scotland where she was inspired to design her jersey sportswear. Other rooms focused on her famous perfume and the "Bijou de Diamonds" - Chanel's one and only high jewellery collection which she created in 1932. 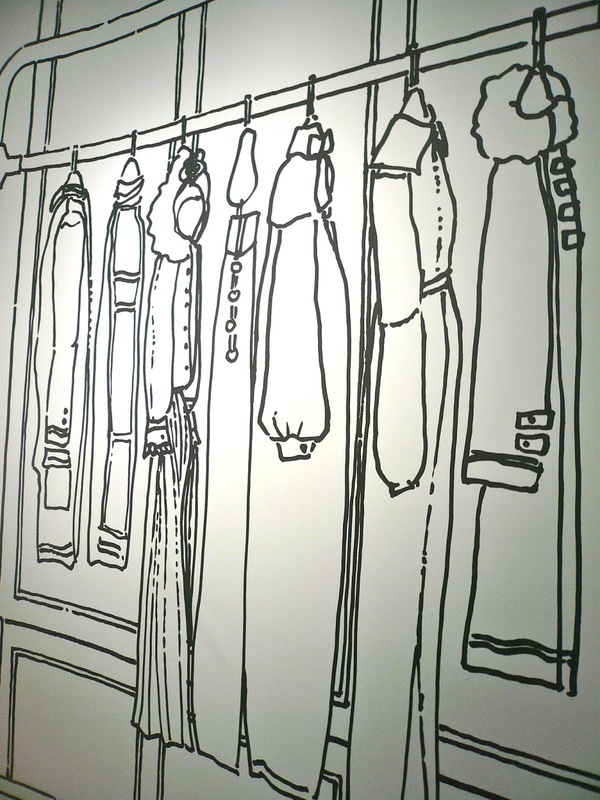 Personally I didn't think there were nearly enough garments on display, and those that were exhibited were in darkened rooms lit up by spotlights. Visitors were herded through the Haute Couture and Jewellery rooms at quite a brisk pace, which was frustrating as I really wanted to spend more time studying the dresses. These rooms were also policed by security guards who gave you a good telling off for ventured too closely to the displays. 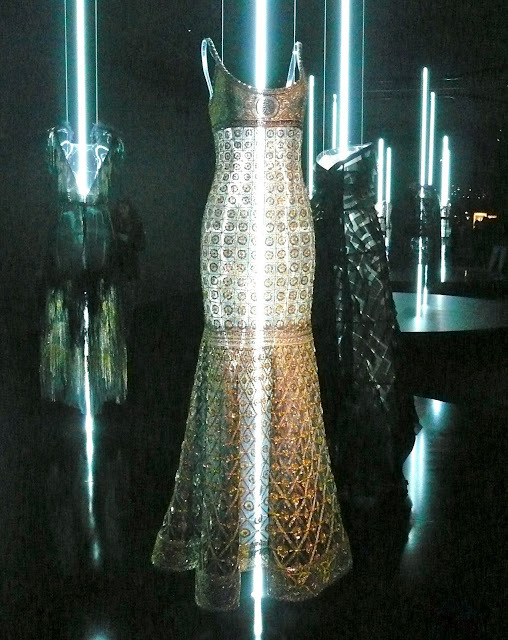 This made it really difficult to see any detail in the garments and almost impossible to see the jewellery. 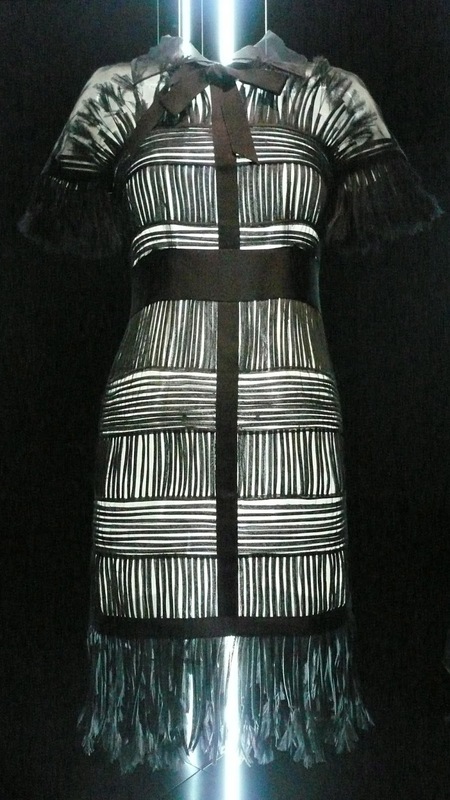 At first glance, I thought the criss cross effect on the dress above was a fabric design. It was only when I got closer that I realised the dress was made up of hundreds of tiny ribbons of crepe sewn together. It was exquisite and I would have LOVED to have examined it in more detail, sadly it wasn't to be - I got a stern telling off just for standing close enough to take this photo! 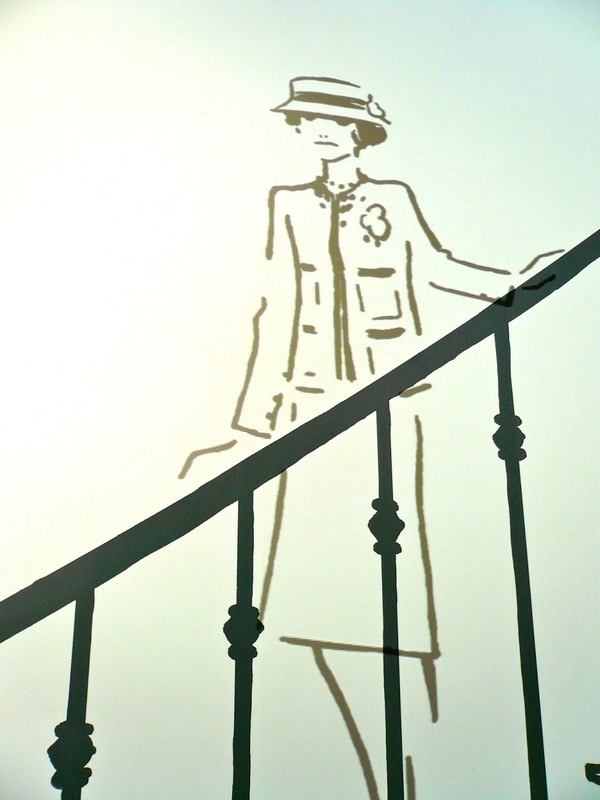 One of the highlights of the exhibition for me was a ten minute movie showing the ghost of Chanel (portrayed by Geraldine Chaplin) visiting the modern day Chanel HQ and having a full blown argument with Karl Lagerfeld! It really made me laugh! The exhibition was free, which I do appreciate, but I would have been equally happy to pay an admission fee and spend a bit more time examining the frocks! Grumbling aside, everything I did see was a feast for the eyes and I'm pleased I went. I was also given a free tote bag and poster, which was very generous! If you're a Chanel fan I do think it's worth making the effort to go and visit. Mademoiselle Privé is on at the Saatchi Gallery, London, and runs until 1st November. Further details can be found here. One thing high on my autumn sewing list was a little black cocktail dress. 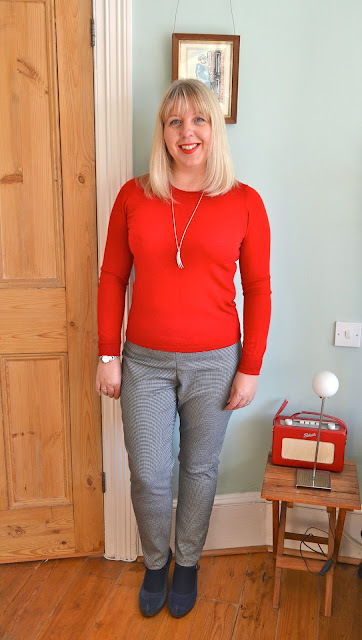 Despite having a bulging wardrobe of dresses, I still have moments (often ten minutes before we're due to go out) when absolutely nothing in there seems quite right. A little black dress seemed like the perfect solution. The pattern I used was Simplicity 1249 - the princess seams and raglan cap sleeves of View B were exactly what I had in mind for my cocktail dress. The pattern is from the Amazing Fit series which come with a choice of pattern pieces for cup sizes (B to DD) and separate cutting lines for different hip types (Slim, Average or Curvy). Cup size is determined by the difference between your full and high bust measurements, so based on this I went for a C cup in size 14 and used the Slim cutting line for my hips. The pattern pieces were almost identical to my dress block which was really encouraging. The theory behind Amazing Fit patterns is that you partly construct the dress, then baste together key areas such as side seams and shoulders. The seam allowance in these areas is a generous one inch, which gives plenty of room for fine tuning the fit. Once you've adjusted the fit to your liking, the seams are sewn as normal, basting stitches removed and seam allowances trimmed down. This seemed like an awful lot of faffing about to me, but to be fair, I did end up making some fitting adjustments so it was worth doing it this way. The instructions also included lots of fitting guidelines which were handy to refer to. My basted together dress was perfectly wearable, but a bit mumsy, so I made a few adjustments for a tighter fit. I took out some fullness underneath the bustline by pinching out the front side seams and I also took in the waist and hips at the side seams by about ⅝". The general bust area and shoulders were a great fit, as was the front neckline, YES! I often have to make adjustments in this area to combat gaping, so this was particularly satisfying. Construction wise, everything went to plan and amazingly there were no mishaps! Princess seams are a bit of a plain to construct because there's so much clipping and pressing involved to achieve a smooth line. I spent a long time at the ironing board with my tailor's ham, but it was time well spent as the seam lines on the finished dress now lie nice and flat. For fabric I used Prada crepe-backed satin from Minerva. The crepe sheds a lot of fibres, but otherwise it's lovely to work with and a really nice quality, perfect for a cocktail dress. The other big advantage is that it's self lined, so no separate lining required, yay! The dress closes with an invisible zip and the neckline is finished with a facing, all very straight forward. This dress is only the second black garment I've made (this skirt was the first one) and I don't think I'll be making another one in a hurry. Karen's tips for sewing with black fabric were helpful, but I still found it a very difficult colour to work with. It was a nightmare to pick out stitches, even wearing my reading glasses, and there were times when I just had to make a stab at where they were as I literally couldn't see a thing! Thank god the zip went in first time, that's all I can say! Remember me waxing lyrical in this post about Til the Sun Goes Down? 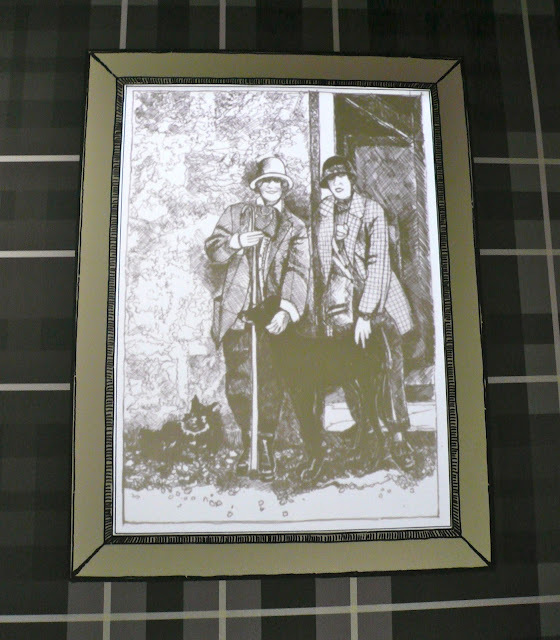 Just to recap, they're a UK-based company producing beautiful dressmaking fabrics in limited edition prints. The fabrics are all inspired by vintage prints from the 1920's to the 1960's and are just exquisite - they really have to be seen to be believed! 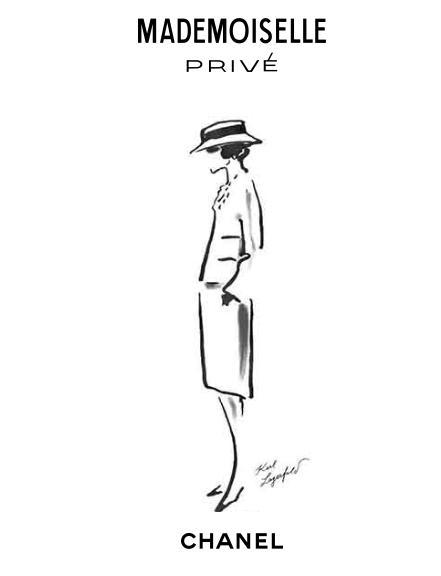 Having purchased from them before (some beautiful crepe de chine which ended up as my 1930's Made Up blouse) I'm on their mailing list, so was delighted to learn that they've recently branched out into sewing patterns. Now & Then Patterns are described as 'vintage inspired, but in today's sizes'. These sizes range from a size 8 (33" bust, 26" waist, 36" hips) to a size 18 (43" bust, 34" waist, 46" hips). There are three patterns to introduce the range. The 1930's inspired Amelie Tuck Blouse has a gathered yoke to the front and back shoulders and tuck detailing at the waist. There's a choice of sleeves (short with an inverted pleat or sleeveless) and two collar options (double or single pointed styles). I like the authentic 1930's design details in this pattern, probably because it's eerily similar to the Simplicity 2844 pattern I used for my Made Up blouse. I don't really care for the double pointed collar though and was alarmed to see that the pattern requires 11 buttonholes. 11? Really? Just for a blouse? That does seem a bit excessive to me, but I suppose that number of buttons would eliminate any problems with gaping! 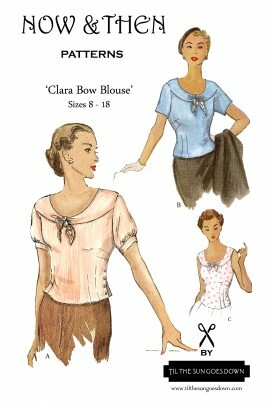 Next up is the Clara Bow Blouse (love the name!) which has a distinctly nautical feel, hoorah! The pattern comes with four sleeve options: straight or gathered short sleeves, long sleeves or sleeveless. There's a removable bow at the centre front and it fastens to the side with buttons, which I think is a lovely touch. Double darts to the front and back shape the waist. This pattern ticks a lot of boxes with me! 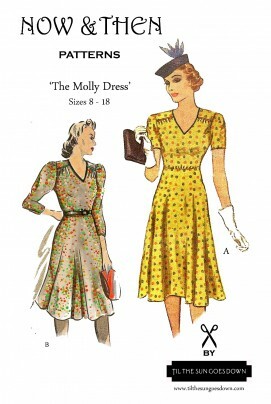 The third pattern in the range is the Molly Dress. This 1940's inspired dress has a bias cut skirt which gives a draped, fluid shape with lots of swing. The waistline is slightly above the natural waist to create the illusion of a smaller waist and longer legs - yes please to both of those! The neckline is bound, with gathers up to a shoulder yoke and there are two sleeve options: a short, straight sleeve or a long sleeve with gathers on the sleeve head. The dress closes to the side with either a zip or placket for press studs. Although I LOVE this style of 1940's dress and have made a couple, I very rarely wear them, so I'll probably give this one a miss. I haven't seen or worked with the patterns yet, so can't comment on the actual fit, but based on the sizing chart, they do seem to be designed with modern body shapes in mind. 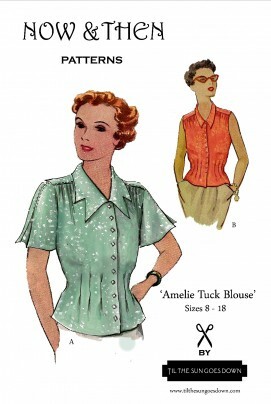 As an example, the measurements from the size 16 vintage pattern I used for my Made Up blouse sit between the size 8 and 10 on the Now & Then sizing chart. Quite a difference! I'll be very interested to see what the instructions are like too. The patterns are quite pricey (£16 for the blouse patterns and £18 for the dress), so the Clara Bow Blouse will probably be added to my Christmas list as a treat purchase. I have too much going on at the moment to make it before then anyway, so it will be a nice project for the New Year. How about you? Do you like the look of these new patterns? Any favourites amongst them ? Behold - my first pair of trousers using my trouser block! I made the pattern during a one day trouser fitting course at Ray Stitch last month, but it's taken me a while to get round to making the final adjustments. Nothing too complicated, just tapering in the width of the legs considerably as that's the style I wear most. On a side note, I've come to the reluctant conclusion that as much as I love them, very wide legged trousers really don't do me any favours. I'm short, and however well fitting around the hips and bum they are, wide legged trousers just make me look even shorter. So it's slim legged trousers from now on, preferably teamed with a giant heel! They're still not perfect - there's a bit of bagginess in the front crotch - but that was as much fiddling as I was prepared to do and I'm happy to wear the trousers as they are. The ridiculous amount of stretch meant I could almost get away without a zip. Almost, but not quite! The zip is positioned up the back seam as that's how we made our toiles (easier to adjust) and I decided to keep it in that position as I like how it looks. In the interests of science I've included a back view. I was worried that the waist would stretch out over time, so it's finished inside with a simple piece of strong elastic. It works like a waistband facing - I just zig-zagged it to the top edge of the waistband, turned it over then stitched in the ditch at the side seams to keep it in position. I cut the elastic a couple of inches shorter than my waist measurement so it keeps the waist nice and snug! I'm pleased that the trouser block actually works! 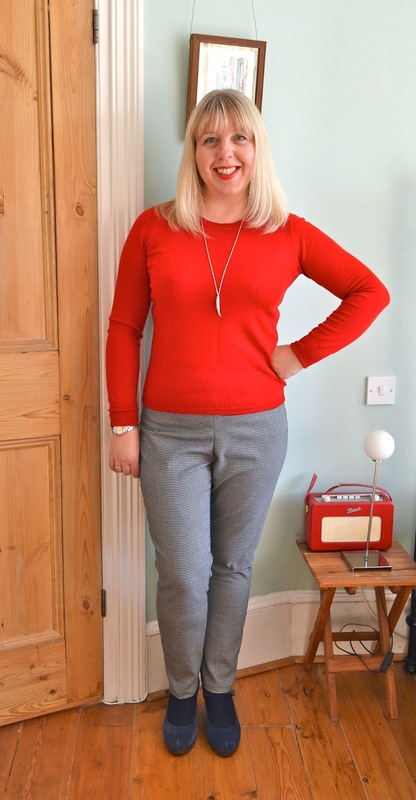 I compared it to what I'd always thought of as a well fitting pair of trousers - the Ultimate Trousers pattern. Amazingly, the crotch curves were completely different, which was interesting. It also reassured me that the course was money well spent! 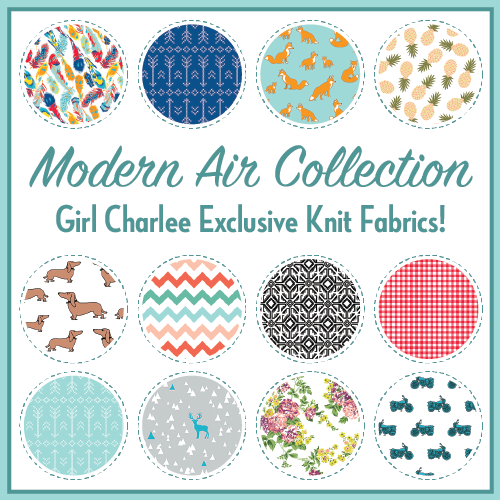 Thank you very much to everybody who entered my Girl Charlee fabric giveaway. The winner is….The Quirky Kiwi, who gets to choose 2m of the fabric of her choice!!!! Yay, congratulations!!! Please contact me with your address details when you have a minute. And for the rest of you, here's a special treat to brighten up this grim Monday morning - Girl Charlee UK are offering a 10% discount for readers of my blog. 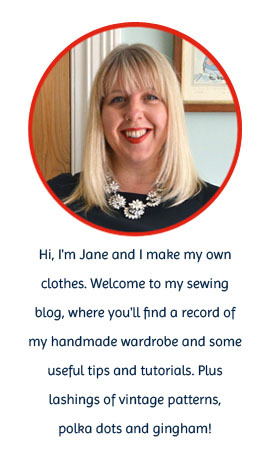 Just use the code JANE10 when ordering from their website. The discount code is valid for the rest of the month and expires on 31st October 2015.